Coach will depart from the Marcliffe at Pitfodels and collect at Copthorne and Old Aberdeen, returning to Marcliffe Copthorne and Old Aberdeen (subject to demand). The tour will include Scotland's Lighthouse Museum, Banff (Scotland!) and Fyvie Castle, and a wide variety of different coastal and countryside scenery. There will also be options to visit Duff House and Macduff Marine Aquarium (each of these at additional cost). Driving north from Aberdeen, your first stop will be at Fraserburgh and the Museum of Scottish Lighthouses. In addition to the Museum itself, there is a tour of Kinnaird Head Lighthouse, the first lighthouse built by the Northern Lighthouse Board in 1787 and constructed in an old 16th century castle. This gives an insight into what it was like to be a lighthouse keeper, and there is the chance to climb to the top and see the lenses and old clockwork mechanism which kept the light turning. The Museum has a café, shop and of course toilets, and is ideal for adults and children alike. Next your Blue Badge Guide will take you west along the coast, passing through Rosehearty and above Pennan (where the film “Local Hero” was filmed), Crovie and Gardenstown to Macduff and Banff. Families may prefer to spend time at the Macduff Marine Aquarium (entry charge around £3 adult; £1.50 child), rather than continue to Banff, where your Guide will give you a short orientation tour before stopping near the town centre for you to wander the old streets, and have time to make your own lunch arrangements. Those who wish may be dropped at Duff House (entry charge £4.50 adults),an 18th century William Adam mansion, which is today an outpost Gallery of the National Galleries of Scotland, for a short visit and perhaps lunch in the cafeteria. Your coach will collect you (at a time advised by your Guide) from the point where you were dropped, to continue to Fyvie Castle, a magnificent building with 5 towers, one added by each family which owned the castle over the centuries. Inside is the finest wheel stair in Scotland, and superb collections of arms, armour and paintings, including works by Batoni, Raeburn and Gainsborough. 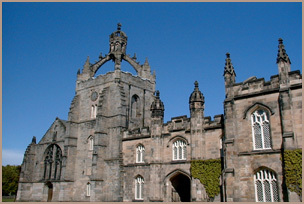 Following your visit to Fyvie, your tour will return to Aberdeen, dropping off at the 3 hotels. COST: £33, (Duff House/Aquarium to be paid by individuals wishing to visit.